This public lecture focused on the natural environment of the Irish Sea coastline from Antrim to Wexford. From its origins in the last Ice Age, the coastline has been moulded by erosion and accretion with numerous sea level changes over thousands of years. This has created a unique set of coastal habitats including cliffs, rocky shores, shingle barriers, sandy beaches, dunes, saltmarsh and offshore islands. Each of these habitats has its characteristic wildlife with highlights including the large seabird and grey seal colonies on Rathlin and Lambay, huge flocks of wintering birds in estuaries such as Strangford Lough, Dublin Bay and Wexford Harbour and the rich wild flowers on sand dunes in Dundrum Bay and the Bull Island. 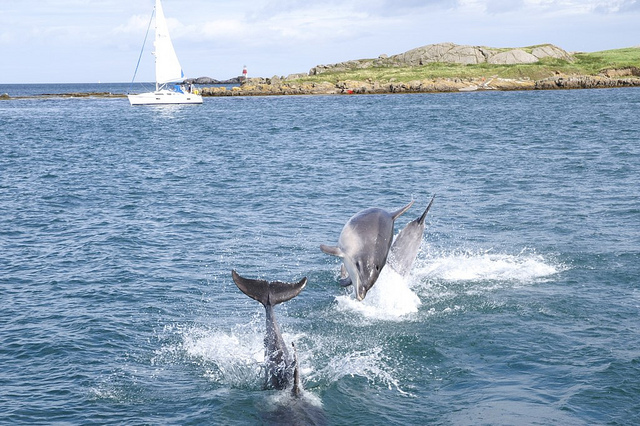 Rathlin and Strangford Lough both support fascinating marine assemblages while offshore there are porpoises, dolphins and whales. Climate change and its associated impacts are already evident so we urgently need a new approach to valuing the natural features of the coast. The lecture is now available to hear on our podcasts page. Richard Nairn is a writer and naturalist who has lived by the sea all his life. His first job was as a nature reserve warden on a magnificent sand dune system in County Down. He has worked as Director of the IWC BirdWatch Ireland and is an experienced ornithologist. He is currently an environmental consultant and provides ecological advice to Dublin Port Company. He is an active sailor and has cruised every nautical mile of the Irish Sea coast. He has written three books including Ireland’s Coastline (Collins Press 2005). All of the presentations and discussions listed below are available to hear as audio downloads by visiting our symposium podcasts page (click here), or by visiting the UCD Humanities podcast page (click here). This panel addressed past and current material benefits of the Irish Sea to the communities around its shores, in terms of fishing, shipping, smuggling, and other kinds of economic activity. This panel discussed research on the natural characteristics of the Irish Sea, on the histories and impacts of human activities on its shores and seabed, and on the relationship between nature and culture. This panel focused on what values and meanings we place on the Irish Sea, how we have represented and imagined it in the past, and on how we think about the sea as a place. In three workshop sessions, the participants were invited to discuss the possibilities for future research which brings together the sciences and the humanities to enhance our understanding of the Irish Sea and its economic and cultural benefits to society.